Settled at Paul Bert Serpette for 28 years, Olivier d'Ythurbide can tell thousands anecdotes about his job. 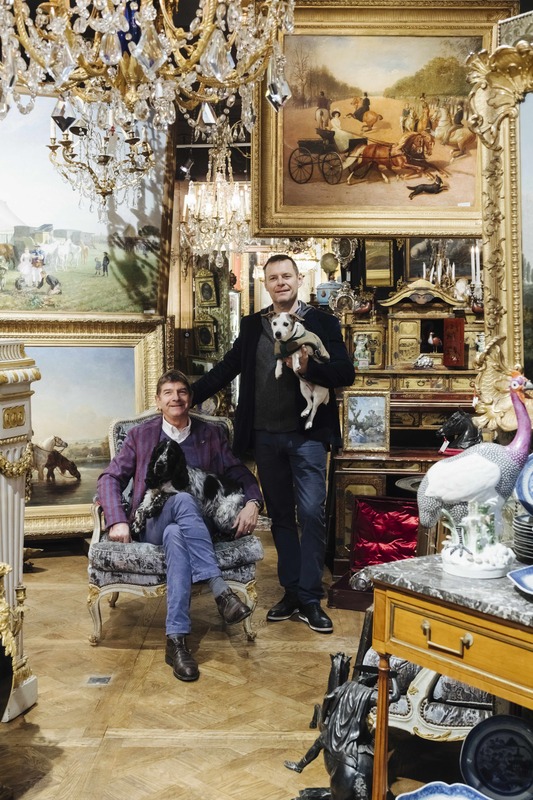 This antiques dealer with exciting course invites you every weekend to discover exceptional classical pieces from floor to ceiling. I grew up in antiques, my parents frequented the flea market and I loved to collect, one of my most beautiful collections was the posters of gallery exhibitions. I also liked to search the garbage cans, especially in the 16th arrondissement where he It was common to find dirty and junk things but that were small treasures I also played a lot at the merchant So I had this job hidden somewhere deep in me. I started with engineering studies in order to work on the national studs. After two attempts and two failures, I deduced that I was really not for the competitions So I went to do my military service, then I worked in a restaurant and it did not like it. A childhood friend of my brother used the basement of a large hotel that belonged to his parents to make a big deposit sale, which was called salle de vente Saint-Honoré and he could not doing everything alone. I was in a total loss of landmarks and it was imperative that I take care. I started to work with him for free. I quickly took the job. For me it was the dream because it was a very big space located between the avenue Friedland and the avenue Hoche. We arrived in whole houses to be emptied which contained treasures. It was a very famous place of all bargain hunters. We could do very good purchases because this friend who held this room did not know much. There was a lot of art market's professionals. I worked there more than 10 years and I finished director of this society. I developed purchases and I came a lot to the flea market. How did you come to Paul Bert Serpette? Our slogan has always been: "to recreate an interior of property" We are specialized in classic pieces, but things evolves. We have clients who allow us to make breakthroughs on beautiful 19th or 20th centuries furniture but our great specialty is painting. Furniture has become more of a means of presentation and creation of ambiances. We also sell many luminaires. We buy a lot in auctions and in unpacking, less and less in the estates. We feel a revival of interest on the classic, and we really felt it at the time of Maison et Objets. We were overwhelmed and relived the weekends of the great eras. Decorators from all around the world who had come for this occasion were there. There was a true interest in the classic. We are starting a turn. This is a magical place because even if you have objects for a long time, some customers arrive and discover them as new things. We also have customers who come to buy and we never see them again. They have a big purchase power and want to furnish palaces. A few years ago, we saw a Cambodian who wanted to furnish his palace has European style. He bought us for about 150000 €. He took out his credit card and we told him that maybe it would not operate. The translator laught a lot and telling us that the bank belongs to him. In Paul Bert Serpette we have this kind of customer and from all around the world. It is a market who make jealous. Many of our colleagues from the Carré Rive Gauche want to come here. When I moved to the flea market, I was afraid to tell my customers because it was pejorative. Now I say it with pride. What is the piece of your booth that you want to highlight? I have this great oil on canvas which is a scene of atmosphere. It tells the story of a horse owner who won a horse show in Gent in 1887. The horse is called Boa and we see the groom who presents the horse and the owner looks at it proudly. This is really a great atmosphere painting of manor house. It fits me perfectly because I am a horse rider and passionate.